It draws attention with replaceable rounding drum to provide various vveights of rolls, adjustable flouring system, electronically adjustable dividing and rounding speed, strong chassis and lubricated gear box. There is a speed control system in proofıng unit that adjusts its speed according to the speed of dividing unit to provide optimum proofıng of the dough. Hence, the dough never spills out of machine and the inside of shielded proofıng unit can easily be monitored from the windows at two sides of it. The dough bowls are sterilized with UV beam before filled with the new rolls and provides a hygienic production line. The heat and humidity of the cabinet is controlled electronically and those parameters are kept stabilized. The dough forming unit is manufactured with materials that are compatible with food production regulations and it has rolling pins and rolls forming accessories. İn case demanded, Kaizer unit and sesame scattering unit may also be assembled into this unit. The dough forming unit also synchronizes its speed with dough dividing unit's speed. The adjustment of forming rollers and rolls forming unitscan easily be made. The last unit of the production line is aligning unit and it runs on pull beck basis. The form of the dough is never destructed and it is possible to make too much work in very short periods since pull back action is very fast. The panel strip is designed as to make possible to make use of ali kinds of pans The dividing unit is controlled with a control panel placed on this unit and the dough aligning distances and the pan sizes are also controlled with this control panel. 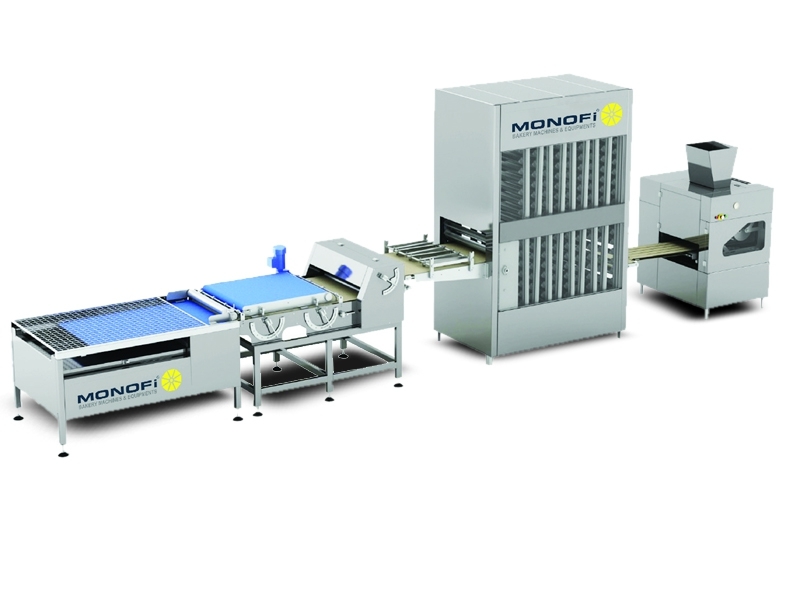 Full production line is manufactured with materials that are compatible with food production regulations and eguipped with full safety mechanism to provide work safety.